A building boom is unfolding in South St George, with hotels and apartment complexes employing hundreds of workers. Demolition work has started in the True Blue area which once was home to No Problem Hotel, Cedars Inn and Mall 21, ahead of the start of the 1st phase, the construction of a 150-room hotel to be completed in 18 months. The 2nd phase involves the construction of 100 high end hotel rooms surrounded by a gym, a 2nd swimming pool, a mall and courts for tennis and basketball. The investor for the $64 million project is Rupert Reece, a Trinidadian with strong Grenadian roots. His mother is Lucille Charles from Victoria, St Mark. This was one of many projects visited on Thursday by minister for international business Nickolas Steele and Prime Minister Dr Keith Mitchell. A short distance away, a 4 storey 40 room apartment complex was also under construction. Lower down the road and still in True Blue, 70 persons were on the job building a 72-bedroom 36-apartment complex. This project started in January and is expected to be completed at Christmas. “Now we are at June, we are on the roof. We expect to finish this in October/November, have it all outfitted and have people walking in here with luggage by December/ January,” the contractor told the Prime Minister, in reference to the project by a Trinidadian businessman/investor. The investor also plans to start construction on a 108 room 6-floor apartment complex, also, in True Blue this September. While overseas and CARICOM nationals have been rushing to invest in Grenada’s building boom, locals are also not getting left behind. On the site of the Blue Star Apartment, Prime Minister Mitchell says that as investor confidence continues to soar more investors are targeting Grenada. 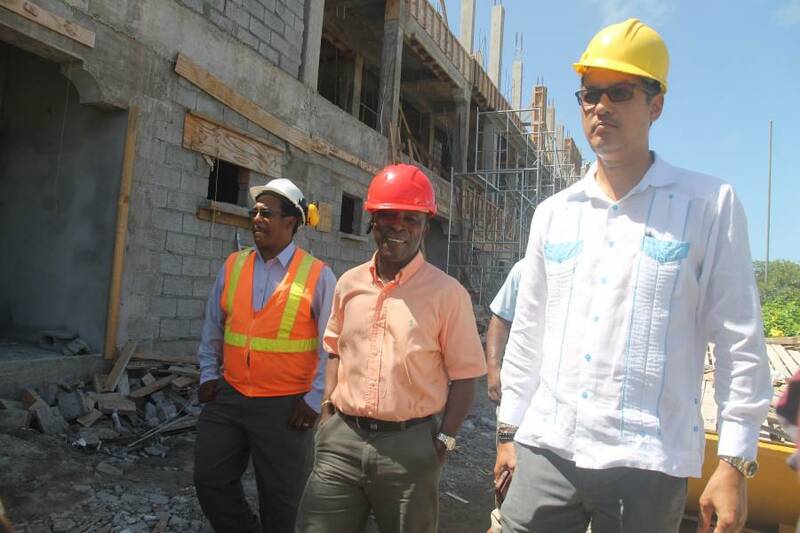 The construction boom in South St George comes on the heels of multi-million dollar projects in that area, the likes of the Silver Sands Hotel project and Clarke’s Court Bay Marina which have employed nearly 1,000 persons.